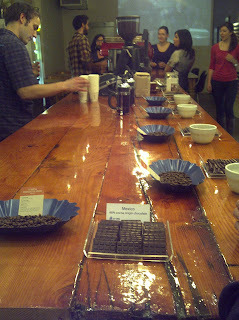 LIT Espresso Bar on College held an amazing event tonight pairing artisan chocolate with Stumptown Coffee. The concept of pairing two food types has worked, and as human nature it's evident that we enjoy creating culinary experiences that highlight complimentary flavours. Tonight we were privy to the first ever event of its' kind. LIT Coffee (Stumptown) paired with David Stubbe's Chocolate. "creating fresh according to the high standards of the Konditorei." Konditorei is the German word referring to a pâtisserie and confectionery shop. He talks about cocoa beans being bought through distrubtors/brokers.. but the first three pairings were actually from origin meaning that they were bought straight from the farm. 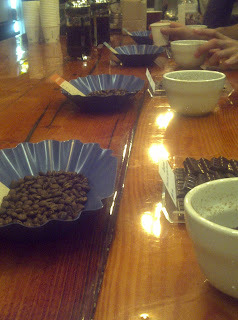 Sourcing from Origins and creating that Direct-Trade is essentially what Stumptown wants to create. What a better way to display these two products than side-by-side. Really what's not to love high caffeine, rich fats, sugar content that is heavenly. Just like Wine and Cheese, Pizza and Soda, Steak and Potatoes, this was just finding components of coffee that would accentuate the flavour profile of the chocolate. We started with less sweet - working our way up the sweetness totem pole, such that the sweetness didn't overpower our palette. Coffee: super clear profile with higher acidity. Second pairing: Eburundi Bwayi w Tanzania 70 % origin. The sharp Tanzania cuts through the mellowmellow bwayi. Not sure how I feel about the coffee, but there was definitely character like a subtlemysterious figure in the background, super great. Buenvista is probably one of the nuttier coffees I have had this year, it really compliments the 72% - as the sweetness doesn't overpower the chocolate too much. Great pairing done by Alex. Los Cauchos, light and airy compliments the sweetest chocolate on display this evening. The nibs gave the tongue a different texture to explore resulting in a memory that will be spoken upon. Not paired: Chili - chocolate was spicy, reminded me of the Mayan style chocolates found at SOMA. 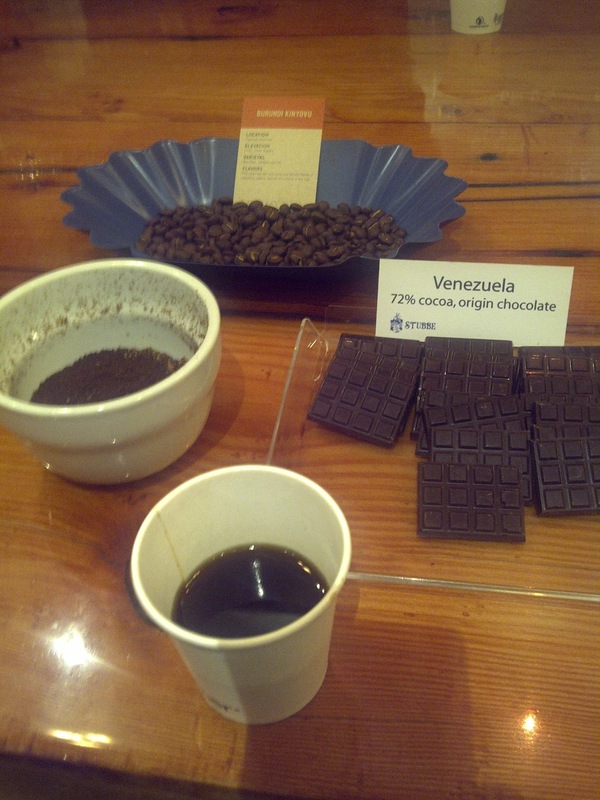 My favourite mix and match pairing of the night: Burundi Kinyovu with the 72% Organic Cocoa. (Not one of the recommended, but it tasted like a DENSE Dutch Chocolate cake. Every sip just meant more yumminess! Hoping that there are more of these pairing events in the future!